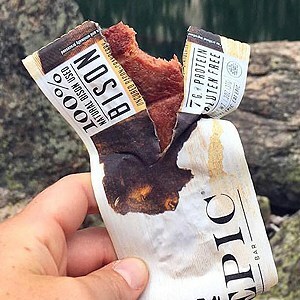 Delicious beef jerky is a true keto staple and a timeless treat. The problem is that most of popular beef jerky brands are loaded with sugar. Unfortunately, companies know that sugar adds taste and can be addicting, so beef jerkies are often flooded with sugar. But not all is gone. 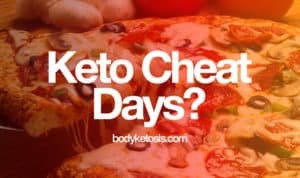 Here are my best 10 suggestions of packaged keto beef jerky that you can enjoy wherever you are and still stay in ketosis. 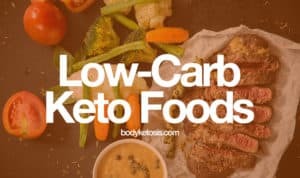 Finding a salty meat bar that's low in carbs and can actually keep you full can be tough. But you know what is epic? Epic meat bar. It's 100% grass fed and a good protein source. In a compact package, a good travel companion that fits perfectly into your camping bag or travel jacket. It seems that Epic managed to succeed in balancing the taste and chewiness of this bar. Chicken sriracha is nice and spicy, and bison has an interesting taste mixed with cranberry. The Chicken Sriracha Bar comes with a stunning 15g of whole savory muscle meat protein. 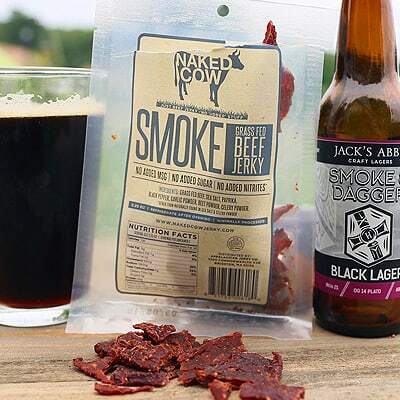 Naked Cow Beef Jerky is made from grass-fed cows and real spices, none of that "udder" stuff. Whether you need the protein to get through your next set of burpees or the fuel to hike a few more miles, Naked Cow is the salty bite you seek. This jerky doesn't have any added sugar, nitrites or msg. And it comes in three flavors: fire, smoke, and honey. The best part is that it has ZERO sugar and ZERO carbohydrates, which makes it the perfect snack for your salty tooth. 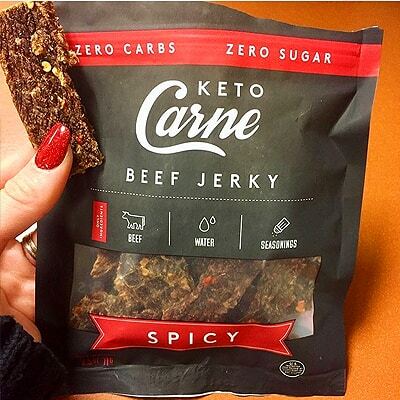 Keto Carne Beef jerky is the keto jerky. It has zero carbs, it contains no sugar and is made only with simple, all natural ingredients - no preservatives, no additives, no nitrates, and nothing artificial. It's made in the USA and is handcrafted in small batches from natural beef. This is what a true jerky is supposed to taste like. Oh, and the shelf life is approx. 1 year and each bag is individually dated with a "Best By" date. People's Choice is LA company providing delicious keto jerky. 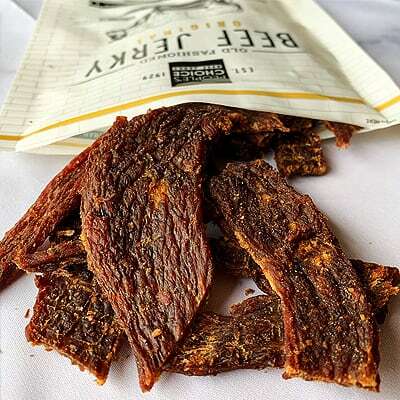 All of the beef jerky snacks located in their Keto jerky collection are 100% sugar-free and 100% carb-free. This jerky is as authentic as possible - whole pieces, thick-cut, chewy steak-like texture, not that soft stuff, taste the meat. If the classical authentic chewy is what you are looking for, then things don't get much better than this. Oh, and its People's Choice is handcrafted in the USA exclusively 100% Premium USA Beef Made in Small Batches. 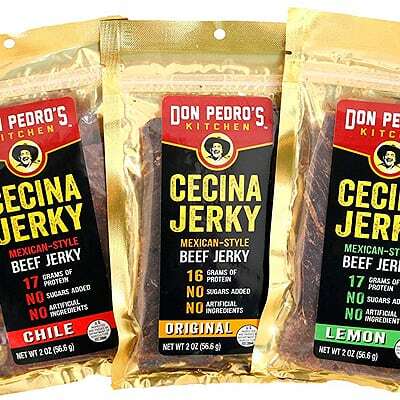 Don Pedro's jerky is a Latin Jerky in an artisanal way, using only the highest quality beef and authentic recipes. It is hand-sliced very thin and marinated. Then cooked and dried over very low heat until crispy and delicious. It doesn't contain no sugar, teriyaki and soy marinades. Cecina jerky comes in three flavors: chile, original and limon. 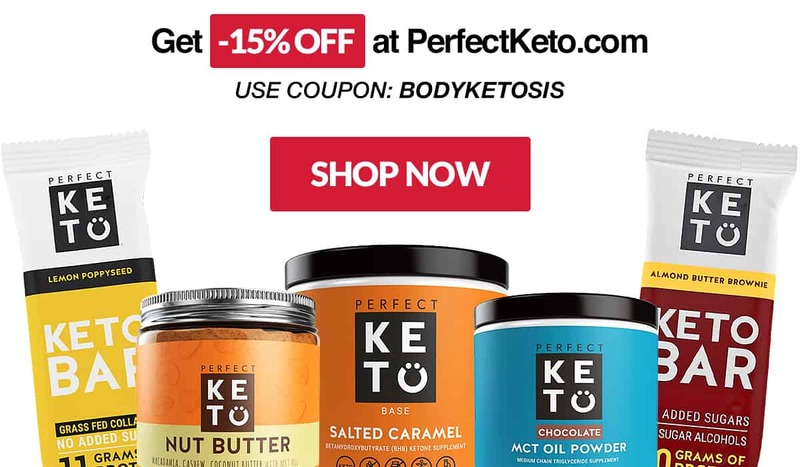 Don Pedro brand is definitely a keto friendly and worth trying out! 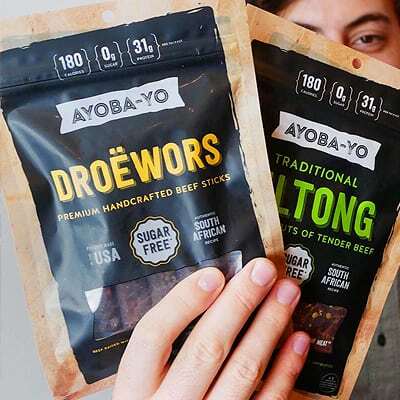 Ayoba-Yo Biltong is a South-African protein snack - Biltong, not jerky. 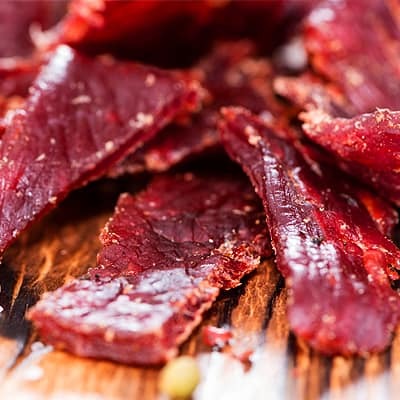 Biltong is a high protein snack made with the finest cuts of beef that are air-dried for over fourteen days, rather than cooked like regular jerky. The result is a tender slice of beef with a naturally explosive flavor without having any sugar or artificial ingredients. Biltong comes with whopping 16g of protein per serving, is 100% keto friendly and definitely worth trying out. 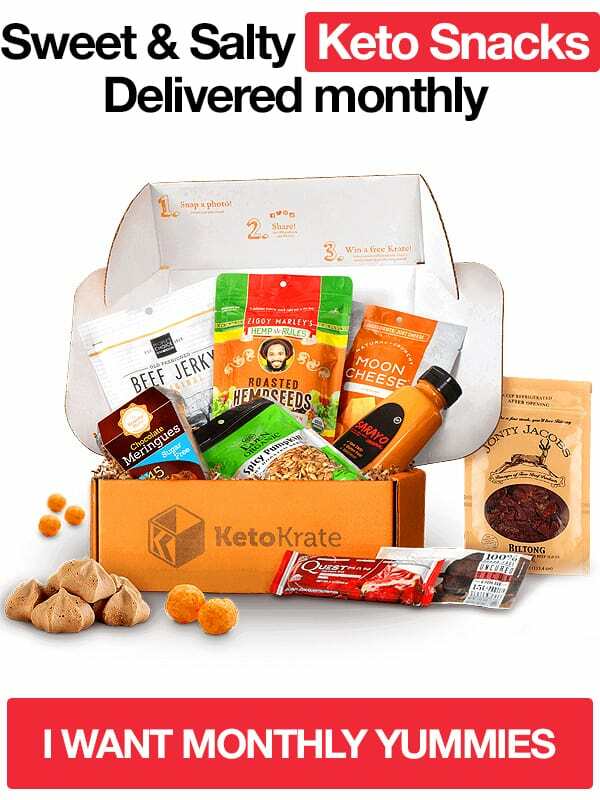 Chomps keto friendly jerky is definitely one of the highest quality jerkies in this list. It's made from 100% grass-fed non-GMO beef and a handful of spices like jalapenos, habaneros, cracked black pepper and sea salt. It doesn't have any added sugar, gluten, soy, dairy, MSG or anything artificial. All of this means that Chomps jerky is as natural as it gets. This is a must try. 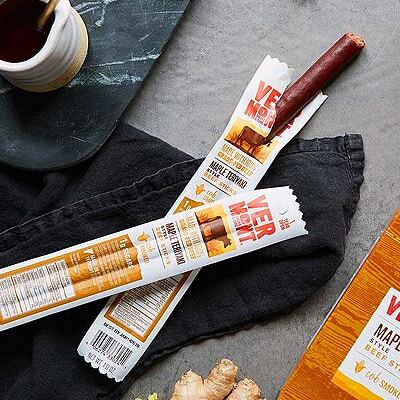 Vermont's beef sticks come with layers of flavor and medium spicy heat. 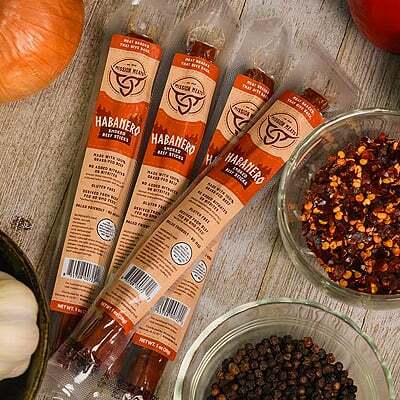 It's made from lean beef and pork raised free of antibiotics or added hormones, chipotle peppers, cumin and garlic for nourishing real meat protein. It's a terrific snack on the go, and the flavor is out of this world. The texture is not mushy but not too dry. Picture slim Jim's but doesn't taste as salt death and has more flavor. Mission Meats is a small family-owned company whos snacks are responsibly sourced and high-quality. These snacks are made with 100% grass-fed, grass-finished, pasture-raised beef. It truly is the ultimate protein snack. Mission Meat snacks are free of without sugar, dextrose fillers, nitrates, hormones, antibiotics or GMOs. Add it to a Blood Mary, throw it into your lunch box or enjoy it with cheese - whatever rocks your boat it suits all. 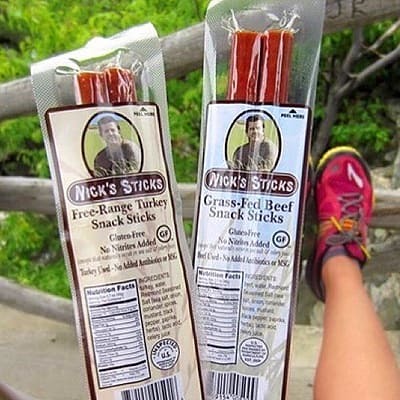 All of the Goodness, None of the Garbage..." Nick's sticks are produced by Wenzel's Farm from 100% Grass-fed and finished cows never given antibiotics or hormones. 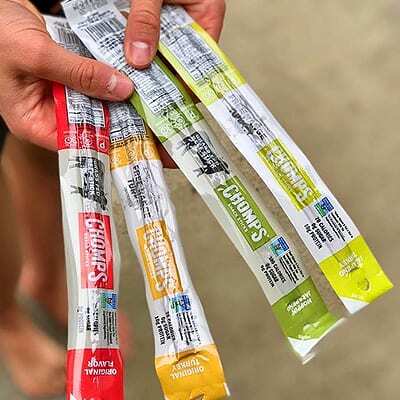 These delicious snack sticks are seasoned with Redmond Organic Seasoned Salt and are free of Nitrates, Nitrites, Gluten, and MSG. 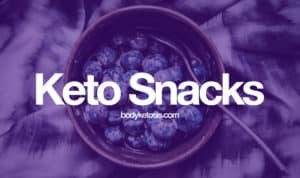 These meat sticks are a great keto friendly "go to" item, for a snack or as part of a meal. And the texture has just a bit of chewiness without being tough. If you hate chewy food, then this is something worth trying out.